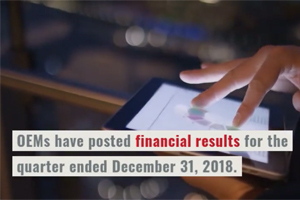 Actionable Intelligence offers comprehensive coverage of the latest news impacting the printer and MFP hardware and supplies industries. If you want detailed and unbiased evaluations of the litigation impacting the industry, new hardware and supplies introductions, financial results, M&A activity, and much more, you can find it all at Actionable Intelligence. We go beyond the headlines, beyond press releases, to offer in-depth analysis of the forces that are shaping your business today and insights that will help you make more informed strategic decisions to ensure you succeed in the future. All our subscription packages include access to our popular bi-monthly email newsletter. Most of the content on the Actionable Intelligence website is available exclusively to Actionable Intelligence subscribers. Not sure if Actionable Intelligence is right for you? We offer risk-free tiered membership packages with a money-back guarantee for individual subscribers and special rates for group access to the site. You can see more information on our guarantee and subscription policies by visiting Site Policies. We give you a variety of subscription choices to better match your individual information needs or the needs of your entire company. We have also enhanced the functionality and value our site provides. See for yourself. Find the package that’s right for you and sign up today! The membership options below are for recurring subscriptions, meaning that your subscription will automatically renew at the end of the subscription term. If you would prefer a one-time subscription, visit our non-recurring subscriptions. Your subscription will expire at the end of your term. Need to gain access to just a few articles or follow a topic short-term? This is the plan for you. Our annual plan is our best value for savvy industry insiders who require longer-term access to all the emerging news, trends, and topics impacting the industry. Get the industry’s latest news and most insightful analysis for less than a dollar a day! Do you need longer-term access to follow a few different topics on Actionable Intelligence? This plan provides access for a calendar quarter and is a better value than our monthly subscription plan.